Police say that a nine-month long investigation into the Five Point Generalz street gang culminated in the seizure of 78 firearms, including 60 that were found to be in possession of one individual. Police executed 53 search warrants across the GTA on Thursday morning but at a news conference on Friday it was revealed that the biggest bust actually occurred about a month ago, when a suspect was pulled over while en route from Cornwall to Toronto. Police allege that the suspect had stashed 60 brand new handguns in the trunk of his vehicle after picking them up from individuals who had purchased them in Florida and smuggled them across the border. 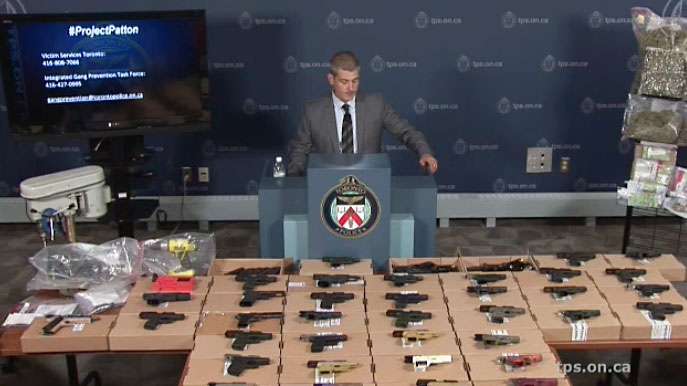 They say that the seizure is the single largest involving illegal firearms in Toronto Police Services history. In addition to the 78 firearms, Belanger said that police also recovered firearm manufacturing equipment with enough parts on hand to produce another four handguns, a large quantity of ammunition, a bullet proof vest and four Tasers. He said that illicit drugs with an estimated street value of $1.2 were also seized during the execution of search warrants, as was $184,000 in cash that police are alleging is the proceeds of crime. Meanwhile, 75 people were arrested and charged with more than 1,000 combined offences. Those offences include charges related to participating in a criminal organization, firearms-related offences, drug trafficking and robberies , Belanger said. 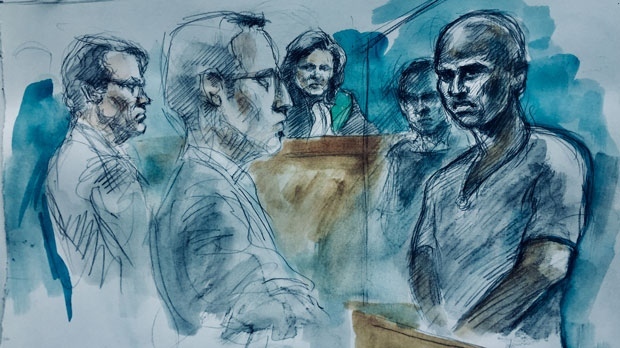 Belanger said that the months-long probe into the Five Point Generalz began in September after investigators received credible information suggesting the gang was behind a number of murders and attempted murders in the city. He said that of those arrested so far, 13 of them were also taken into custody during another investigation targeting the Five Point Generals back in 2010. That investigation was dubbed Project Corral and coincidently also resulted in the arrests of 70 people. The Five Point Generalz gang has roots in the Weston Road and Lawrence Avenue area but is connected to crime across the city and extending into the U.S. and the Caribbean, according to police. Belanger said that while investigators are confident that they have rounded up the highest ranking members of the Five Point Generalz, they also realize that the busts won’t eradicate gang violence in the northwest corner of the city. “We realize that when we make mass arrests like this and seize firearms and drugs like this that it creates a void. We realize that drugs equal easy money and there will always be people willing to step in and fill that void,” he said. While none of the suspects taken into custody on Thursday are facing homicide charges at this point, Belanger said that some of them are charged in connection with firearm discharges and attempted murders. He said that the investigation remains “fluid” and that additional charges are possible. In the wake of arrests police plan to put additional officers in the part of the city where the Five Point Generalz were most active, according to Deputy Chief Jim Ramer. Ramer, however, told CP24 that he is confident that the gang has at least been dealt a significant blow that will keep them from operating for the time being. “I think right now they are ineffective. We have taken out the entire hierarchy of the gang and quite frankly they are not going to be able to operate,” he said. About 800 police officers from 12 different police services participated in Thursday’s raids. Toronto police provide an update on Project Patton, a nine-month investigation into the alleged criminal organization behind the Five Point Generalz. 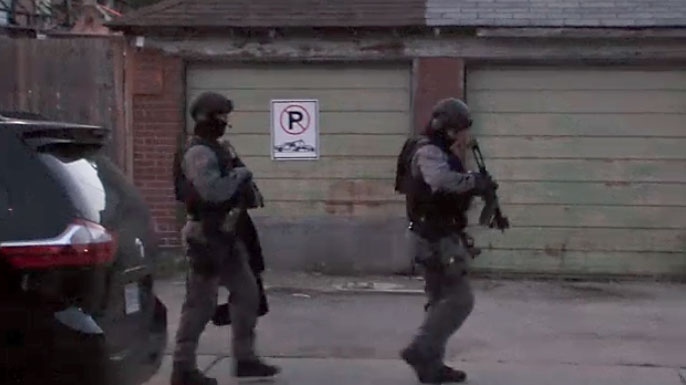 Tactical officers conduct a raid in Toronto as part of a targeted investigation into alleged criminal organization on June 21, 2018.